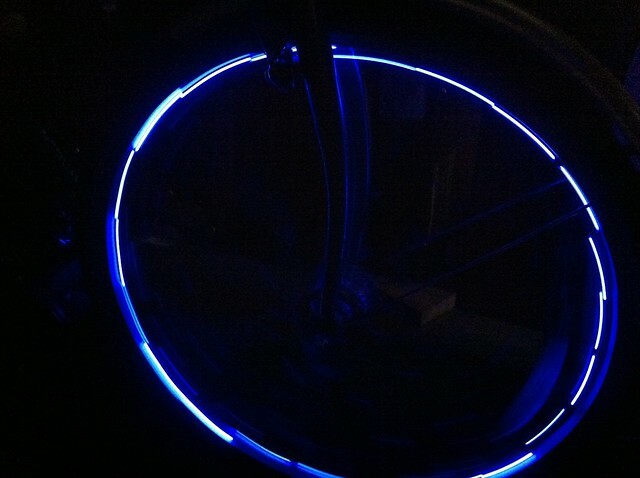 And finally framed it with el wire to make it a bit more visible. 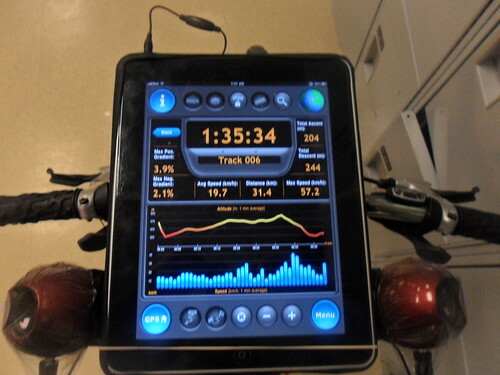 I’m riding with my Ipod and headphones for about a year, when I swerve into the lane to prepare to take a left turn, without shoulder checking. There was a vehicle there that had to slam on its brakes to not hit me. Totally my fault. Believe me, I didn’t lean without checking my blindspot after that. But it still nagged me that I couldn’t hear traffic coming up behind me. I get an Ipad. I decide to build a mount for it, and use the built-in 2watt speaker. Woot, no more headphones. The Ipad is protected with a “Zagg Shield” a vinyl wrap that cusions and protects it from scratches. So, I’m totally in love with this thing. I’m using Motion-X GPS-HD app. which is a sport GPS. It’s designed especially for bikers/hikers/skiers, pretty well anything that isn’t driving. They also have an excellent driving app that’s separate. I got tunes rocking all the time with its built in itunes player. But I’m not happy with the 2 watt output. Another thing: with the GPS app giving me performance metrics now, (distance traveled, avg and top speeds, altitude and speed charts) I find myself biking farther every day, my 6k commute, becomes 10k, and then 15k as I circle my town to get to work. And I find I’m doing 30-40k on the weekends too. A little research turns up http://xm-i.com/en/stereo-speakers/x-mini-max-ii?page=shop.product_details&flypage=coddii_fly_default.tpl&product_id=1&category_id=1 . These speakers have internal battery, great sound, 10hrs of play time on a single charge, and recharge via USB. 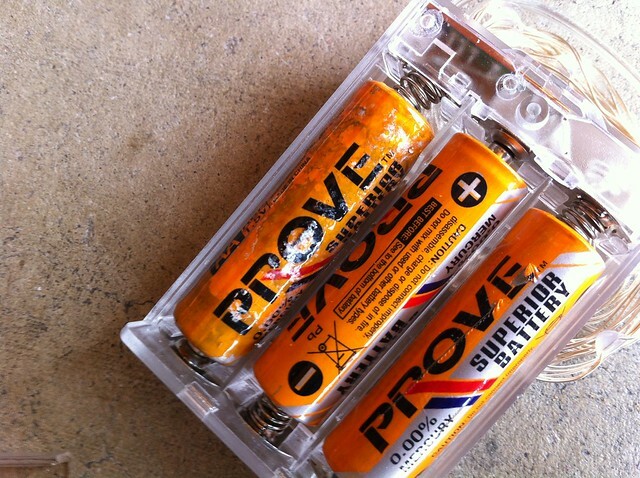 An important consideration, because the whole unit pops off as a single piece, and plugs into a USB hub to recharge. I add a T shaped piece of aluminum (grabbed from Home Depot, the kind used to frame 2×4’s in construction) between the hard case and the GPS mounting plate, and use a 60 minute epoxy to glue the speakers to the plate after roughing both surfaces to allow the epoxy to better grip. Now I have 5 watts of power or 2.5 times the volume of the ipad alone. Its actually ear splitting at max volume, In traffic, in high winds, I keep it at 70%. Now, I found I had to make a playlist that was public friendly. One day on the way home, I was at an intersection, beside a family of pedestrians, when the Violent Femmes singing “Dance Mother******* Dance” came on at near max volume. 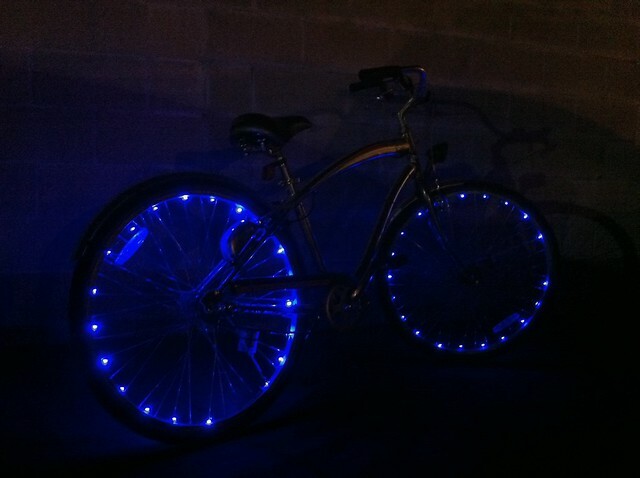 As for the El-wire. I simply wanted to add more visibility to my profile. And look as stunningly cool as possible while doing it. I sincerely regret not getting the cobalt blue. I faltered at the last second and went with red as I wanted to match the Kona Fire mountain frame. But I regret that decision. The red just isn’t as sharp as the blue would have been. 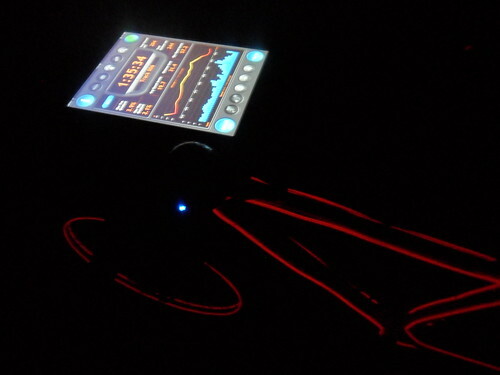 The 5mm elwire runs about 1.33 a foot, and it took about 40 feet to do the whole bike. I soldered the connectors and drivers myself. 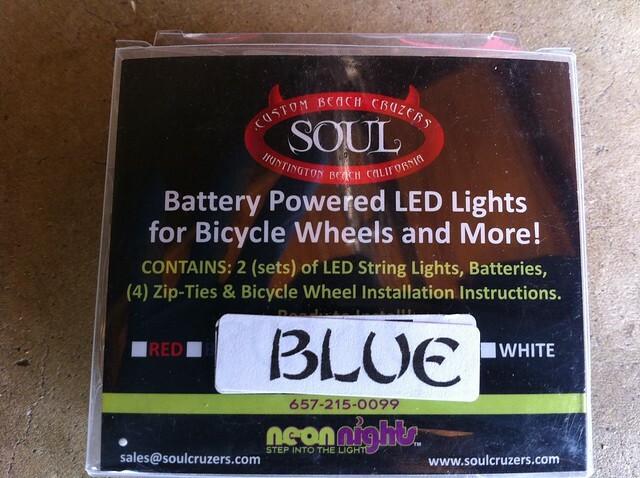 each wheel has its own inverter and 9v battery. The bike itself runs on a 12v 8xAA battery pak under the seat. 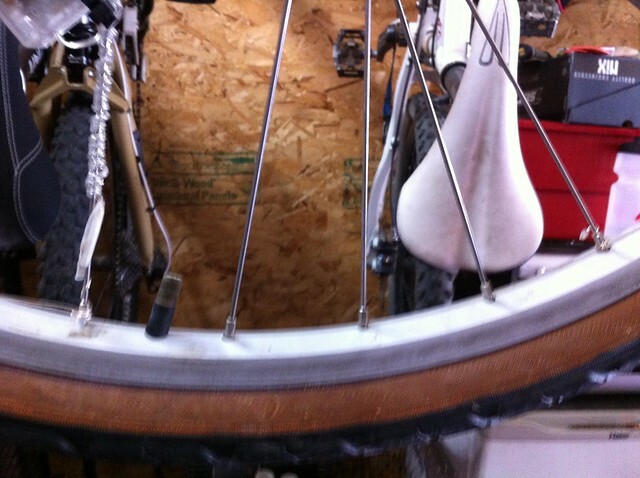 I used some simple plastic zip ties to affix it to the frame, and epoxied the wires to the rims of each wheel. 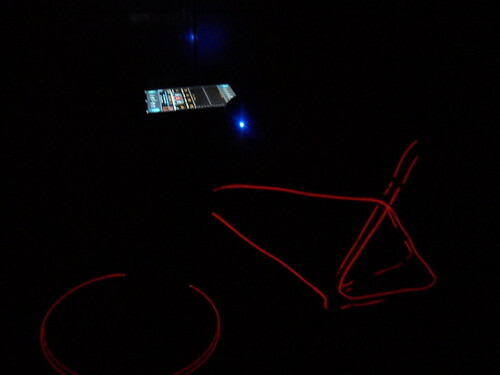 I run with the el wire solid on, but the drivers also give me strobe and slow flash and various blink options. You’re welcome to share as much or as little as this as you like. Im thrilled that anyone would be interested. Everyone at my work is mostly sick of me talking about it hehe, although they were pretty darn impressed with the ipad stereo. 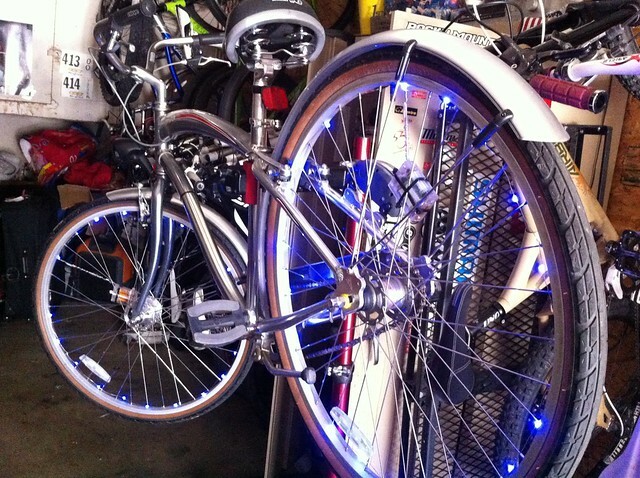 Now, you know we love some DIY around here at Bikecommuters.com…and the funkier, the better. Hope you enjoyed this creation too!